More than 1,400 pedestrians cross Fletcher Avenue each day. Between 2006 and 2010, the Sheriff’s Office reported 63 pedestrian accidents for the section of Fletcher from Nebraska Avenue to 50th Street. 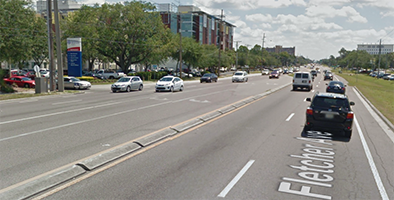 One of the highest pedestrian crash rates in unincorporated Hillsborough County, of these 63 crashes, three resulted in fatalities and 22 in incapacitating injuries. The County is also producing an educational video to be shown in north Tampa community centers and on television monitors at the University of South Florida. Brochures will be distributed at schools, retail establishments and other places people congregate. Construction began in August 2013 and is expected to be completed in late July 2014. The cost of the project is $4.7 million, including a $2.5 million safety grant from FDOT. For more information, contact the Hillsborough County Public Works Department at 813/635-5400, or visit the Fletcher Ave “Complete Streets” Pedestrian & Bicycle Safety project website.